M Gymkhana is all about making riders better. No matter what you ride there’s always room for improvement, we are all learning something new every time we through our leg over. Motogymkhana although not exactly street riding, gives you the ability to really improve your riding on your daily commute in terms of feel, comfort, acceleration and braking. If you notice in the picture, the fingers of the rider are no where near it. 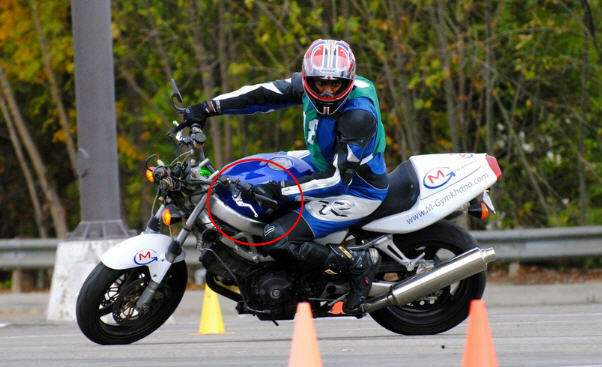 That’s because when riding motorcycle gymkhana it is best not to use the clutch at all, except to start and stop. This is where the rear brake comes into play. The motor should always be engage in order to have a measure of driving force, which naturally makes the bike more stable (especially at slow speeds). For example, even though the rider above is using a big V-twin, once in a rotation turn, forward motion produced either by opening the throttle slightly or setting a higher idle speed, with the addition of varying rear brake pressure allows the bike to rotate much more smoothly through the arc of the turn. The job of turning for the front wheel through the contact patch and suspension is much easier and consistent which allows it to work more efficiently. There is no “pogoing”, the suspension is stable, the bike is stable and there are less factors to focus attention on, save the next cone and when to open the throttle and release the rear brake fully to get out of the turn. Of course when you come out to an event, we will work with you more directly on how to improve in this technique and show the difference between: to “clutch it” or not to “clutch it”. Thanks for visiting us on our 1st MGym® TecTip! PLEASE PLEASE comment on what you think of the post and we look forward to seeing you soon.